We’d love your help. 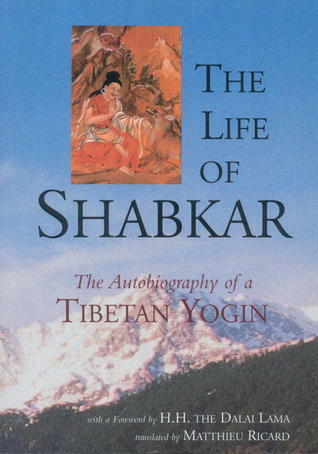 Let us know what’s wrong with this preview of The Life of Shabkar by Shabkar. To ask other readers questions about The Life of Shabkar, please sign up. This is a bit of an odd book. Whereby it must be added that it is most likely odd only from a modern Western perspective. One day a poor Mongolian vagabond turned up. Rifling through my provision bags, he set about stealing one of them. At that very moment I said: Thief, you have come! Wonderful! One day a poor Mongolian vagabond turned up. Rifling through my provision bags, he set about stealing one of them. At that very moment I said: Thief, you have come! Wonderful! We’ll see if I, the mountain dweller, The so-called “renunciate,” Can behave in keeping with my name. Let’s see if I have really understood The main point of the Dharma. We’ll make some tea and drink it together. If you live far away, stay here for the night. Let’s discuss both worldly and spiritual things. Then I shall give you whatever I have. Accordingly, the thief and I boiled some tea, and as we were drinking it he asked, “Where is your native land? In which monastery do you live? Do you have any family at home? What is your name?” I answered with these words: My native land is all lands, In no particular direction. My monastery is the solitary mountains, In no particular place. My family is all the beings of the six realms. My name is “Hermit Protected by the Three Jewels.” At this playful reply, the thief burst out laughing and said, “Lama, you are a gifted speaker” [49a]. Then, having given him what little I had, I sang: I pray to you, father, King of Dharma! Grant your blessings That my mind may remain free from attachment! Open your ears, thief, and listen carefully. I see everything as illusion. Having neither accumulated wealth nor craved it, I have never owned illusory possessions. Beyond what you see, I have neither food nor riches. See for yourself! Now, if you don’t know me I shall tell you frankly— I was born in Rekong Shohong; As to my father, I am a disciple of the King of Dharma, Chögyal Wang. I am a practitioner of the Great Perfection; My name is Tsogdruk Rangdrol. Having meditated again and again On all beings as my parents, I am free of the duality of enemy and friend. Having found the sublime inner wealth, I am glad to give you whatever outer wealth, Food, and possessions you desire. Now, just relax and be content. On the occasion of this virtuous action, I dedicate all merit accumulated in the past, And all to be accumulated in the future, So that you and all beings May achieve supreme Buddhahood— Such is the way of the Bodhisattvas. Content, the man did three prostrations, wished me good-bye, and went on his way. One day, one of my benefactors came and said that divinations and astrological calculations indicated that an evil charm had been placed in his home, but he could not find out what it was. He urged me to do a divination. I remained evenly in the natural state for a while, and, within this sky-like evenness, I looked to see what the cursed object might be. I saw that under a large wooden case of butter was an old offering lamp with a short stand and a broken rim. Curious as to its origin, I saw that it had been taken out of a pond by the lady of the house five years before, and because of this, she was suffering recurrent difficulties with her right hand. All these images arose clearly in my mind. As I related this to my patron, his faith grew stronger and he said, “Grant us your protection—though you keep it hidden, you have unimpeded prescience.” Saying this, he left. Thereafter, when people insisted on having me perform a divination, I was able, after remaining for a while in equanimity, to know the good and the bad of things. Thinking that such prescience might prove quite presumptuous and unreliable, and realizing that all this might invite disturbances and create obstacles to my practice, I later kept silent about such matters and claimed to know nothing. Pleased with my answer, he went on, “Well, my son, if that’s so, you’re not wrong. Meat, liquor, sense pleasures, worldly enjoyments—the best things of samsara are temporarily beguiling. Young brides in the full bloom of youth and beauty are expert at leading one astray. Therefore, even if you have as your companion a young daughter of the gods, have no attachment, have no desire. Why? Speaking generally, because all the things of this world are without essence, impermanent, unreliable, and by their very nature lead to suffering [22b]. In particular, because domestic life is like a pit of fire, a cannibal island, a nest of poisonous snakes. Enjoying the entire array of samsaric perfections, wealth, and pleasures is like eating food mixed with poison, like licking honey on a razor blade, like the jewel on a snake’s head: a single touch destroys. Most kind mother of mine, listen a bit. Remaining in the world that is samsara, There is no contentment, And within that, this home—a pit of live coals; A wife—a sorceress stealing the life force of liberation. So I ask you, with all your loving-kindness, To give me permission to give up my home, And devote my life to the holy Dharma, So that we, mother and son, May win the citadel of lasting contentment. As it swayed from side to side, I heard this song in the rustling of its petals: An offering! My father and mother are the sky and the earth; I am the child nurtured by warmth and moisture. See how beautifully I display my fine petals, Waving them in the ten directions! They are my offering to the Three Jewels. Listen to me, mountain dweller: The yogin for whom all phenomena appear as scriptures Is satisfied with the book of the phenomenal world. You, so-called “hermit,” collecting all sorts of scribbling, Stagger under the weight Of your load of worn-out books. If these books and instructions Are not present within your own mind, Why should you carry such a burden of writings? When you roam around the mountains To whom can you complain of the hardships you endure? I don’t want to hurt your feelings, But, in fact, you even lack awareness Of impermanence and death, Let alone any realization of emptiness. For those with such awareness, Outer phenomena all teach impermanence and death. I, the flower, will now give you, the yogin, A bit of helpful advice On death and on impermanence. A flower born in a meadow, I enjoy perfect happiness With my brightly colored petals in full bloom. Surrounded by an eager cloud of bees, I dance gaily, swaying gently with the wind. When a fine rain falls, My petals wrap around me [46b]; When the sun shines I open like a smile. Right now I look well enough, But I won’t last long, Not at all. Unwelcome frost will dull these vivid colors, Till turning brown, I wither. Thinking of this, I am disturbed. Later still, winds— Violent, merciless— Will tear me apart Until I turn to dust. When I think about this, I am seized with fear. You, hermit born in Lower Rekong, Are of the same nature. Surrounded by a host of disciples, You enjoy a fine complexion, Your body of flesh and blood is full of life. When others praise you, you dance with joy; When faithful patrons turn up, You sit in a dignified manner; When they shower you with lavish food, You smile with satisfaction. Right now, you look well enough. But you won’t last long, Not at all. Unwelcome aging will steal away Your healthy vigor; Your hair will whiten And your back will grow bent. Just thinking about it, Don’t you feel chastened? When touched by the merciless hands Of illness and death You will leave this world For the next life, Vanquished and powerless. Just thinking about it, Aren’t you seized with fear? Since you, mountain-roaming hermit, And I, a mountain-born flower, Are mountain friends, I have offered you These words of good advice. I dipped in and out of this exhaustive and thorough tome, as I was using it primarily for Ricard's incredibly inclusive index. Shabkar Tsogdruk Rangdröl (Tib. ཞབས་དཀར་ཚོགས་དྲུག་རང་གྲོལ་, Wylie. zhabs dkar tshogs drug rang grol) was a Tibetan Buddhist lama and Dzogchenpa considered to be an emanation of Milarepa due to his yogic lifestyle and prolific composition of spontaneous poetry and songs.